Boeuf bourguignon - or beef burgundy - is the quintessential French stew. 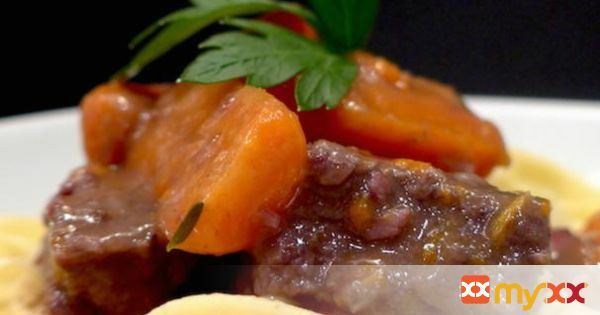 Its flavors combine the strong aroma of red wine with the delicacy of the bouquet garni, the sweetness of the carrots with the smokiness of the bacon. Unlike Julia Child has led so many Americans to believe, boeuf bourguignon is truly a one-pot dish. The prep time is quasi non-existent (less than 15 minutes), and the stew simply cooks itself! 1. In a large cast iron skillet, fry the bacon until golden brown, set aside. 2. Brown the beef for a few minutes on high heat, add the onion, then the flour, mix together and heat for 1-2 minutes. 3. Add the carrots and the red wine. Cover the meat with water and add the bouquet garnish, bacon, chicken or beef stock cube, salt and pepper to taste. Bring to a boil, then cook for 2-3 hours on low heat, uncovered – remove the bouquet garnish. 4. Serve with fresh tagliatelles or steamed potatoes and serve.